The Four Horizons Lodges were designed for “weekend away” tourism for couples. The site is along a cliff top at 430m above sea level adjoining the Watagan National Park overlooking the Hunter Valley ‘Winecountry’. The two storey configuration was introduced to facilitate upper floor views and reduce the footprint in the established forest. 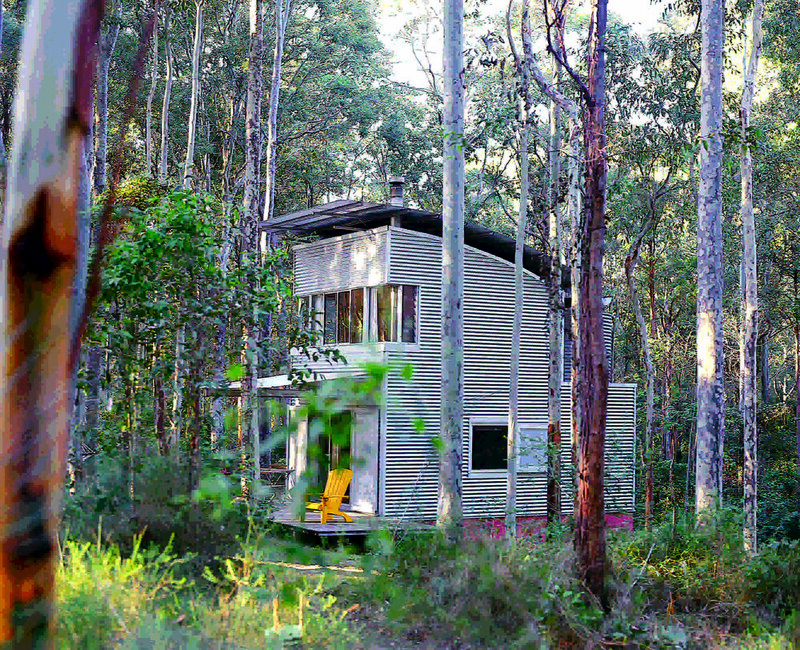 The lodges are on the same property as the main house at Four Horizons, where strategies for environmental sustainability demonstrated that it is possible to reduce energy consumption in a family home to one third of the NSW average while maintaining interior temperatures at 10˚C warmer than outside on a cold winter morning, and up to 10˚C cooler on a hot summer day, without recourse to artificial heating or cooling. 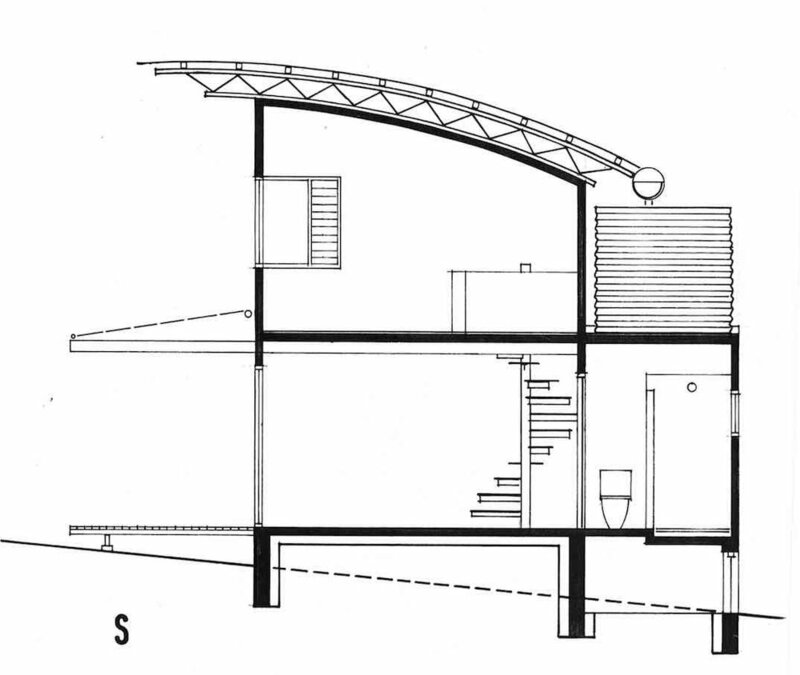 The lodges adopt similar principles with another version of a ‘fly roof’ as used on the main house – in this case curved steel lattice trusses have, on top, a primary roof of corrugated steel and, to the underside, an insulated sub-roof also of corrugated steel, providing a ‘parasol’ with 300mm clear air gap. Orientation to 25 degrees east of north captures morning winter sun and the ‘peak’ of the roof cuts out high summer sun. Thermal mass is provided by concrete lower floor slabs and concrete block external and internal walls at ground floor level. The walls are insulated on the outside and clad with corrugated steel. The lower floor interiors are painted with potent colours. A steel spiral stair leads to a bedroom of different character - light calico, conceived as a verandah room. Upper floor walls are lightweight steel framed. Electricity is from the solar system at the main house wired underground. 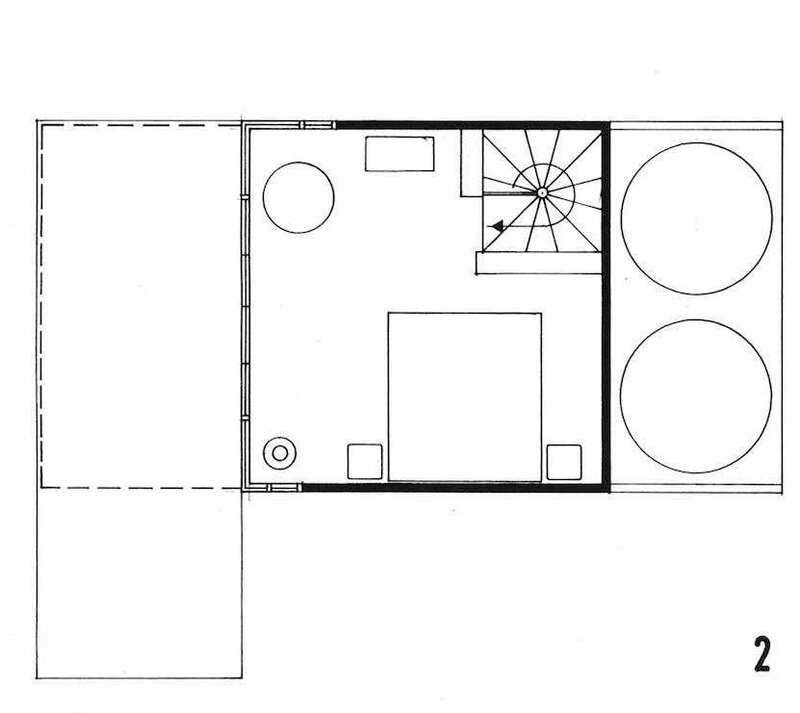 Two steel water tanks are located on the flat roof at the rear over the kitchen and bathroom and collect rainwater from the main roof through trough gutters threaded through hoop brackets. A retractable fabric canopy is fitted to two cantilevered steel beams over a deck at the front. 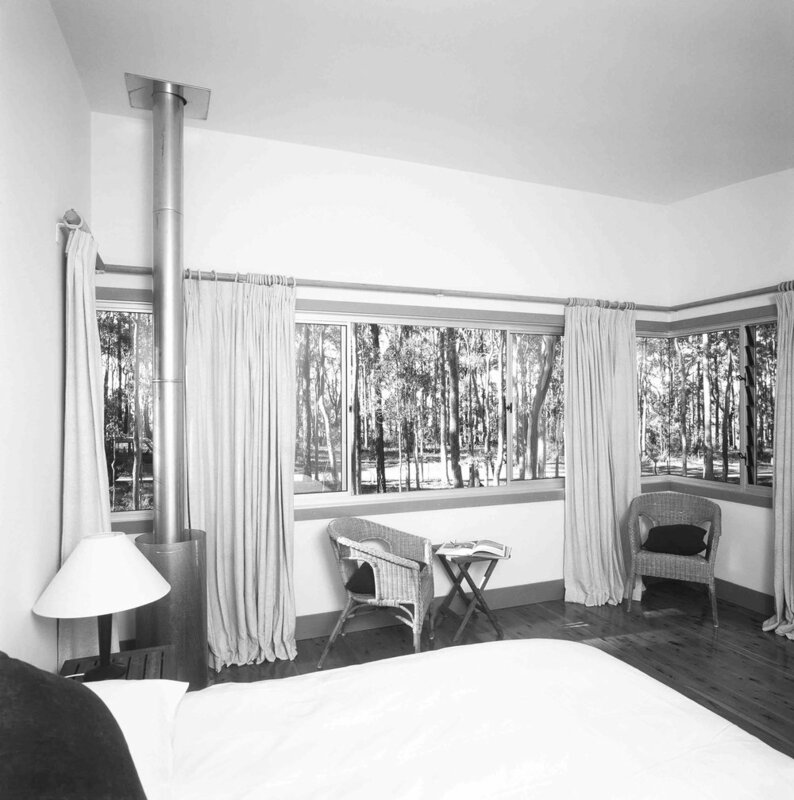 Lower floor windows are fitted with perforated steel shutters, that can be closed to provide protection from bushfires. The lodges function well, fulfilling their thermal objectives and run on extremely low energy - energy use 0.375GJ/m2 per year, GGE (greenhouse gas emissions) 20kgCO2/ m2 per year. Photos : Michael Nicholson, Steve Brown and Lindsay Johnston.